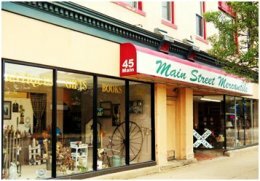 The Main Street Mercantile, 45 Main Street, Bradford, Pennsylvania, is located within the National Historic District of Downtown Bradford. This artisan and antique co-op offers over 70 vendors all located under one roof and merchandise changes on a regular basis. Local photography, books, and handcrafted items by local artisans. Shop for hand crafted alpaca clothing, hand-made jewelry, yarns and knitting supplies. For your home browse the selection of furniture, fine artwork and photography, rugs, garlands and wreaths, candles and potpourri. The children’s section features a wide variety of educational toys. Here you will also find a nice selection of local author books along with the talented artwork of local artisans. Foodies will enjoy the selection of teas, jams, dips and mixes, local honey and wine accessories for serving along with a lovely selection of glassware, china and linens. The second floor has a year round Holiday room, along with a used book store.